The Empire of Ashes – Book Three of The Draconis Memoria – is released today in the US and Canada. Links to reviews are on the book page. You can also read a sample chapter here. New maps have also been added to the Map Room for the benefit of e-book owners. Huge thanks to my agent Paul Lucas and everyone at my publisher Ace/Roc for their hard work in publishing the third and final volume of The Draconis Memoria, most especially my editor Jessica Wade. To celebrate the imminent release of The Empire of Ashes I’m holding a mailing list signed books giveaway. Existing subscribers to my mailing list and anyone who subscribes between now and midnight GMT July 1st are automatically entered. One first place winner will receive a UK hardcover. Two second place winners will receive a US hardcover. Three third place winners will receive UK trade paperbacks. All books will be signed, lined and dated (with a personalised dedication if requested). The winners will be chosen and notified on July 2nd. 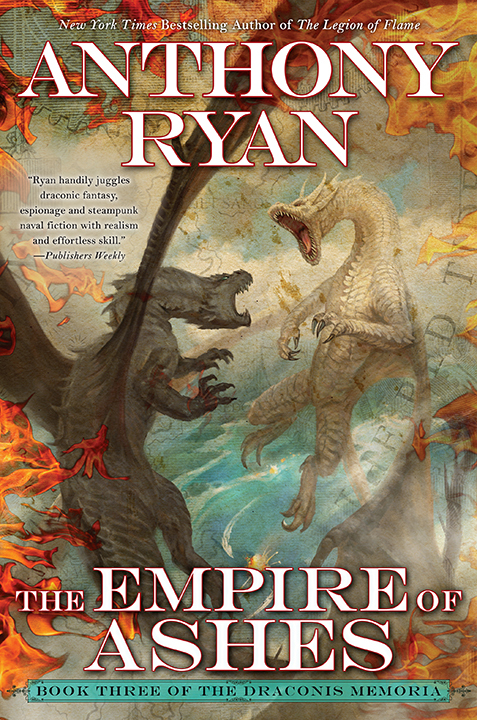 The Empire of Ashes is released in ebook, audio, and hardcover in the US on July 3rd and in the UK on July 5th. Pre-order links are on the book page.